Success Drives Us. Diversity Inspires Us. We win together when we work together. We are committed to creating and sustaining an inclusive work environment where individual uniqueness is sought, valued, and leveraged; every individual can maximize their contributions for the collective success of Cintas and the markets we serve. was shocked to learn that heart disease is the No. 1 killer of women. Even with the devastating effect heart disease has had in my family for generations, I was not aware of its pervasive consequences for women everywhere, especially women of color. The American Heart Association is positively impacting heart health in our community – and as a woman, mother, sister and wife, I feel compelled to be involved. 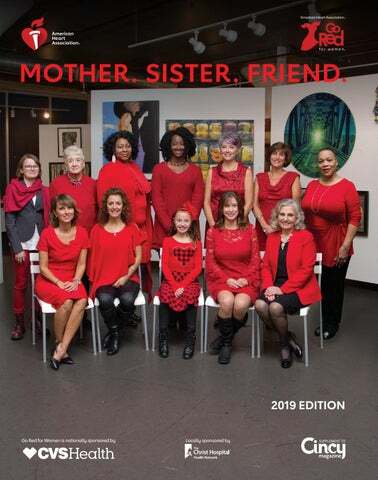 Our 2019 Go Red for Women theme says it best: Women are unstoppable, and together we will save the lives of our mothers, sisters, friends – perhaps even our own. Pam Webb, Vice President, Human Our mission is to impact 20,000 Resources at Ohio National Financial Greater Cincinnati women of all ages by Services with Barbara Turner 2020 through education, awareness and driving change in our community. Our impact on these women moves the needle for AHA’s 2020 impact goal: improve the cardiovascular health of all Americans by 20 percent, while reducing deaths from cardiovascular diseases and stroke by 20 percent. At Ohio National, we’ve come together to support AHA’s work and have taken steps to improve our own heart health with the Check. Change. Control. program (more about that below). Seventy-two percent of associates who participated improved their blood pressure through continual monitoring. I hope to encourage organizations throughout Greater Cincinnati to adopt this program and improve the long-term health of the people who work for them. I’m honored to lead Go Red for Women in 2019 and make a difference today and for generations to come. I personally want to thank every person who has given time, effort and financial support for this important cause. Please join me in working to ensure that women live longer, healthier lives. During the first four months of 2018, 464 associates from Ohio National participated in the American Heart Association’s Check. Change. Control. program. Seventy-two percent showed blood pressure improvement. Twenty-two percent brought their blood pressure from an uncontrolled state to a controlled state, significantly reducing their risk for heart disease and stroke. Ohio National’s medical staff offered blood pressure screenings in the lobby one day each week and every day in Ohio National’s on-site medical clinic and fitness center. Participating associates tracked at least two blood pressure readings each month using AHA’s Check. Change. Control. tracking website. With ongoing blood pressure monitoring, the medical staff was able to help associates maintain healthy blood pressure levels and work with them to lower readings in the elevated or hypertensive categories. Multiple associates have continued to monitor their blood pressures using the tracking website even after the program ended. Ohio National will begin its 2019 Check. Change. Control. program again in January. On the cover: Front Row (l to r): Lori Mascall, Terri Kersey, Bailey Hemingway, Bethany Moeddel and Lynn Maatman. Back Row (l to r): Katie Noble, Charlotte Ferguson, Tabbatha Kelly, Meka Butler, Wendy Dean, Diana Gibbs and Sandra Wright. Experience the Power of the Red Dress With the support of our committed sponsors and dedicated volunteers, we Go Red all year through outreach programs designed to meet people where they are. Here are just a few ways we painted the town RED this last year: LIFE IS WHY FASHION SHOW Thanks to the generous support of UC Health, we held our third annual Life Is Why We Wear Red Fashion Show. UC DAAP students shared their red dress designs and local survivors and their stories were featured on the runway. young girls through these programs. moms to take their family’s heart health to heart while also raising awareness about congenital heart defects. For more information, email jenny.hobbs@heart.org. Calendar of Events Women’s Health Conference Thursday, Jan. 17 Oasis Conference Center Presented by Ohio National Financial Services, the conference offers educational sessions to inspire women to live their healthiest lives. Private event. 16th Annual National Wear Red Day Friday, Feb. 1 Wear RED to show your support of Go Red for Women. For downloadable information, visit GoRedForWomen.org/WearRedDay. Greater Cincinnati Heart Ball & Young Professional After Party Saturday, March 2 Duke Energy Convention Center Presented by TriHealth and St. Elizabeth Healthcare, this 26th annual black tie gala will honor the Fisher family with the Heart of the City Award and include interactive auctions and Young Professional After Party. For more information, visit cincinnatiheartball.heart.org. 14th Annual Go Red for Women Experience Wednesday, April 24 Duke Energy Convention Center Presented by Ohio National Financial Services, the Experience offers exhibits, health screenings, educational sessions, luncheon and fashion show. For more information, visit cincinnatigored.heart.org. HeartChase Saturday, May 18 Newport on the Levee Presented by St. Elizabeth Healthcare, HeartChase is a race using smartphones which guide participants through checkpoints to solve interactive challenges. For more information, visit heartchase.org. Heart Mini Health & Fitness Expo Presented by Worldpay Saturday, March 9, 9-5pm Duke Energy Convention Center Sunday, March 10 Downtown Cincinnati Medpace’s 15K Heart Mini and St. Elizabeth Healthcare’s Heart ½ Marathon – 7:30 am UC Health’s 1K Steps for Stroke – 9:15 a.m. Ohio National Financial Services’ 5K Heart Race – 10:30 a.m. 2K Kids Race – 11:30 a.m. Mercy Health’s 5K Heart Walk – noon For more information, visit heartmini.org. STEM conference returns for second year M ore than 200 high school girls from 16 schools in Greater Cincinnati participated in the 2nd annual STEM Goes Red conference on Nov. 13 at Xavier University’s Cintas Center. Students took part in speed mentoring with some of the area’s top female executives, giving the girls an opportunity to ask one-on-one questions. Keynote speaker, Dr. Philecia Avery, delivered an inspiring message encouraging young women to pursue their dreams. Other activities included breakout sessions on hands-only CPR, the health impact of vaping, the science of scent, STEM careers in the construction industry, and an escape room game with a focus on technology. WHY STEM AND GO RED? Life is why we stand together MOTHER. SISTER. FRIEND. he Circle of Red Society is an elite group of women who are making a commitment to fight the No. 1 killer of women. These women make a minimum personal gift of $2,500 annually to support Go Red for Women and serve as ambassadors for the cause. The Circle helps fund research grants needed to find a cure for heart disease, increase awareness about women’s risk of heart disease and stroke, and strongly impacts the younger generation by educating them about the importance of a heart-healthy lifestyle. For more information on how to join, contact Amanda Mills at (513) 699-4208 or Amanda.mills@heart.org Thanks to Kendra Scott for providing a selection of jewelry for this photo shoot. 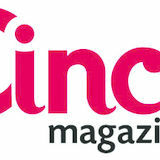 The Greater Cincinnati Circle of Red has more than 75 members and is one of the largest in the country. Back Row (L to R): Dr. Gail Kist-Kline, Rosemary Schlachter, Robin Everhart, Deborah Hayes, Jenny Matthews, Cathy Lindemann, Kris Attema, Jillian Scherzinger, Barbara Turner and Thanh Pham Front Row (L to R): Vera Hall, Cindy Broderick, Jill Brinck, Philecia Avery, Pam Webb, Connie Kreutzjans, Shirley Yoshida and Laurie Conkright See page 12 for a complete list of names. hat is Men Go Red for Women? A dynamic, committed group of men who are rallying their resources to fight heart disease, the No. 1 killer of women. By personally donating a minimum of $2,500 to the American Heart Association’s Go Red for Women campaign, these men stand behind the women they care about – their wives, mothers, daughters, sisters and friends – while also influencing others and inspiring communities. Members of Men Go Red raise awareness and provide funds for lifesaving programs and research that fuels the development of medications, surgical innovations, treatments and recommendations for preventing heart disease. Because of our dedicated supporters, we are leading the fight against heart disease and stroke. Back Row (L to R): Dr. Eugene Chung, Charley Lindemann, Glen Attema, Dr. Louis Louis and Gerald Sparkman Front Row (L to R): Tom Anderson, Jim Reese, George Kreutzjans, Dr. DP Suresh, Dr. Tom Broderick, Dr. Richard Becker and Kevin Hughes. See page 12 for a complete list of names. Lebanon, OH It was a 65-degree November day i n Oh io, so my friends and I took our k ids to t he park after school. I challenged my son to a race up a hill, and by the t i me I reached the top, I couldn’t speak or move the right side of my body. An undiagnosed ASD allowed a clot to leave my heart and go straight to my brain. I received tPA within 90 minutes and all my symptoms resolved within 20. My advice for women is to be your own best patient advocate. Educate yourself. Ask questions of your provider. Insist on the best care. Edgewood, KY I have one of the most complicated congenital heart defects ca l led Hypoplastic Left Heart Syndrome (H L H S) . T h i s mea n s t he lef t ventricle of the heart is so small a nd underdeveloped, t hat I had open heart surgery in my first week of life – along with other staged surgeries – to rework how my heart pumps blood to the body and lungs. My other staged surgeries, at 2 weeks old, 6 months old, and 3 years old, were all successful, thanks to the amazing team at Cincinnati Children’s Hospital. The fourth, most recent surgery in 2013 at age 4, was unanticipated but needed because of a narrowing between the atriums. Today, I have overcome more than most people go through in a lifetime. I am active, loving, caring and outgoing. I have a passion for soccer, volleyball, swimming and playing with friends. It has made me fearless. My advice for women is to realize they are not alone, and that if I can fight, so can they. was so blessed this procedure was available to me. I will celebrate my five-year “Vadiversary” on Jan. 14, 2019. I am active, have a part-time job and lead a full, healthy life. So don’t give up! Keep your faith and pray for yourself and others. And don’t exclude your family on your journey. Diana Gibbs, 59 Cincinnati, OH A s a s a le s rep, work i ng long, hard days was nor ma l for me. While traveling to Louisville to give a presentation, I felt sick to my stomach. I stopped and bought a bottle of water and Bayer a s pi r i n . I to ok three aspirin because the bottle said I could. After six hours, I was traveling home and there was a squeezing pain in my left wrist and elbow. I decided to stop at Christ Hospital to get checked out. That was the most important decision I made that day. The doctor on call found a blood clot in my branch artery, which had caused a heart attack. The aspirin kept my blood thin, so there was no damage to my heart. If you have a heart attack symptom, take an aspirin and get checked out by your doctor or go to the hospital. tion classes were a challenge, as I was never anyone’s first pick. Despite this, I never let anyone drag me down, and since then, I have continued to work hard on my studies. Don’t ever let your body, inside or outside, define who you are. You are you. It doesn’t matter if you’ve had a stroke or a heart defect. Be who you are, and never let anything stop you from living life to the fullest. to my bedroom to lie down. That’s when I dropped my cellphone and shattered the screen (something I never do). Immediately, I knew I had to get to a hospital. I was having a stroke. At the hospital, I found out I was having TIA’s, and while they were treating me for the TIA, I had the stroke that we all think about when we think about a stroke. The doctor said if I had taken a nap as planned, I may have never woken up. When you feel strange, or feel something is wrong, don’t explain it away. Get help. Tabbatha Kelly, 49 Cincinnati, OH At age 44, I su f fered f rom congestive heart failure. No one k new what was happening to me, not even my doctor. I did not f it t he t y pica l profile. However, my hear t had been failing for t h r e e mont h s . After a vigorous medication plan, cardio rehab, and two years out of the woods, I thought I was home free. When April 2016 arrived, I was facing heart failure again. This time I was told the only medical provision left was a pacemaker/ defibrillator. I opted for the surgery and now consider myself the “bionic woman.” There is strength and victory in this disease. You have to choose not to be a victim. You can be victorious! Wendy Dean, 50 Cincinnati, OH The same year Go Red for Women launched, in 2004, I survived a heart attack at age 35 and was diagnosed w ith coronary artery disease/atherosclerosis. My left anterior descendi ng a r ter y (t he w i d o w m a k e r) was 70 percent blocked. The diagonal and other smaller arteries had blockage, too. My heart is damaged but functioning normally with two stents and medications – making me exceedingly thankful for AHA funding and research. Until that day, I had no idea heart disease was the No. 1 killer of women. I never once suspected my fatigue and other symptoms were heart related. Know your family history; monitor and understand your blood pressure and cholesterol; be aware of trans-fats and sugar in your diet; manage anger and stress; and keep exercise and sleep at the top of your to-do list. Terri Kersey, 48 Cincinnati, OH In 2014, I climbed Mount Kilimanja ro i n A f r ica for seven days, and it was awesome. The next day we took an a w e -i n s p i r i n g safari trip. That evening, a f ter dinner, I had an ischemic (hemi) stroke. It was a week before I made it back to the United States for proper medical treatment. I want to empower other stroke survivors. Be active! Courtney.martin@heart.org or call (513) 699-4224.